Paul Oscher said, "I don't play no pretty blues." What he does play is some of the best Chicago style electric blues you will here today. 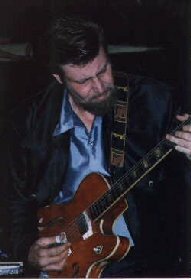 Best known for his harmonica work in the Muddy Waters band during the late ‘60’s, Oscher also plays a great blues guitar and piano. Born in New York, Oscher first met Muddy Waters at the Apollo Theater in 1965. Then in 1967 (and just 17 years old) he got a call from Luther Georgia Boy Snake Johnson, the current guitar player in Muddy's band. They had some shows out east and Big Walter Horton didn't make the trip so they asked if Paul was available to play harp. Oscher said, "I played two numbers for Muddy and he said, 'can you travel?' And I said, YES." That was the start of a four year gig as the first white guy to play in Muddy Waters' band. Otis Spann and S.P. 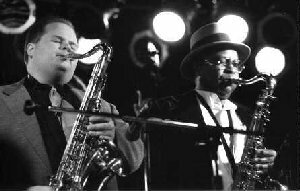 Leary were in the band when he started, later replaced by Pinetop Perkins and Willie Smith. Photo © 1998 by Ray Stiles. Oscher's show was the first at the "new" Biscuits and Blues (formerly Orrie's), in Bandana Square. His first set, which lasted over two hours, featured gutbucket, down in the alley blues played in the traditional 1950's Chicago blues style. 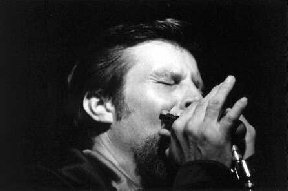 Oscher has that traditional, full-bodied harmonica sound reminiscent of the players he learned from -- Little Walter, Junior Wells, James Cotton, Sony Boy Williamson 1 and 2 and Big Walter Horton. This was classic Chicago blues harmonica and a pure delight to listen to. He was taking us to school big time on the harp. It was fun just watching him switch back and forth between two harmonicas without missing a beat. During his song "Tin Pan Alley," from his 1996 Blues Planet release "The Deep Blues of Paul Oscher," he even had a Junior Wells sounding pop during his harp solo. Later he said he was thinking of Junior when he was playing the song and he just threw it in. During the break he was walking around chatting with fans, telling stories, and joining in conversations just like he was one of the crowd. Oscher is also an accomplished slide guitar player (picked up from Muddy Waters) and piano player (picked up from Otis Spann). He didn't have a piano available at this show so we got to hear more of his great harmonica and guitar playing. His slide guitar playing has a very strong resemblance to Muddy's style - raw, earthy and powerful with some leanings to Hound Dog Taylor. He started the evening off with "Hideaway" on slide guitar and I thought Hound Dog WAS in the room. Oscher's band included Danny Cadillac on drums, Matt Raymond on bass and Little T. on guitar. Little T. plays a lean style of blues guitar that reminds me a lot of Twin Cities' guitar player Jeremy Johnson. Oscher also said this kid, who is 18, is just about the age he was when he started touring with Muddy. Paul also picked up two very good saxophone players on his way through Chicago for this show. Jesse Scinto, who has played here with Sam Lay and Willie Young, a long time sax player in Howlin' Wolf's band. Paul Oscher writes, sings and plays songs that could easily have been written 40 years ago. This was a superb display of raw, deep electric blues that we don't get to hear enough of these days. Oscher has two very good CD's out, "Knockin' On The Devil's Door" on Vice Roots records and 'The Deep Blues of Paul Oscher" on Blues Planet Records, both released in 1996. You can also hear Paul's great harp playing on the 1971 Muddy Waters' album "Live At Mr. Kelly's."